Nearly 77% of teen students have admitted to being a victim of bullying. That’s 77 %. Bullying is on the rise and has reached epidemic proportions. But our guest today offers hope and resources for those under attack. Actor Quinton Aaron from The Blind Side knows first-hand the struggles of obesity and bullying as he experienced both as a young man. That’s why he created the Quinton Aaron Foundation to provide hope, encouragement, confidence and resources to children on the brink of suicide or battling the damaging effect on their self-esteem and confidence caused by the actions or words of others. 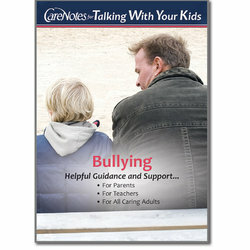 Offer Description: This pamphlet would be helpful whether the child in your life is being bullied or is the bully. This can help the child overcome the effects of bullying and offers tips on how to communicate with the child.